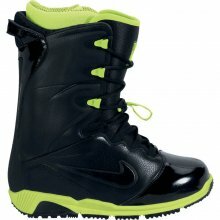 The Nike Zoom Ites is the stiffest boot in Nike’s line up and its a great freeride to stiff all mountain boot. If you like the Nike Kaiju but like even more response here is the Zoom Ites. It’s like the Kaiju with a hard stronger shell. It has a way to make it even more stiff if you want by adding a boomerang like insert to the sides of the liner. It’s kind of like the power panel you can add to the Burton Driver X and also a direct competitor to that boot. The Nike Zoom Ites is not for everyone but for some it will be everything. This is a great boot for those that like a stiffer flex for the freeride or aggressive riding lifestyle. It’s made to fit around your foot very well and definitely earns it’s $400 price tag. Nike reduced the footprint for all 2013 models and they did it very well. We compared the Zoom Ites Footprint to the Burton Driver X, Burton SLX, Burton Ion. The foot print was almost identical so the new line of Nikes is right there with the leader of reduced footprint technology. It’s really hard these days to recommend a boot that doesn’t have a reduced footprint so it’s good that Nike did this very well. Flex: Pretty stiff. It’s stiffer than the Kaiju even without the boomerang insert and with it it’s even more stiff. Stiff and response often go hand in hand and this is no exception. Comfort: For many this will be comfortable starting day one because it’s built around your foot very well. 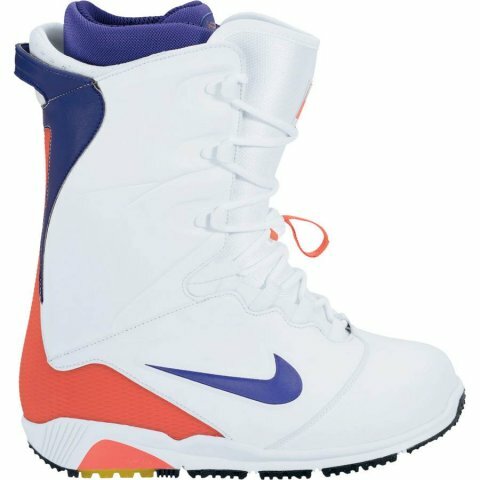 It’s a little tighter in the toe box than say Burton or 32 boots. This isn’t good or bad but just what it is. The liner, boot shell and traditional lacing do a great job making your foot/ankle/shin feel comfortable in the boot and it’s right there with the best of the best when it comes to fitting the average foot. Heel Hold: The Heel hold is more than most need. If you have smaller ankles or issues with heel lift this should keep you down. The only boots that offer more heel hold are Double BOA boots but most don’t offer this level of adjustability and comfort. Adjustability: For some the lacing system might be a turn off but to us this is probably one of the best traditional lacing systems out there. Each upper rung locks in place very well and the little harness at the ankle gives you the ability to tighten the upper and lower separately without using a mountaineers knot. The Liner has a traditional lace set up but it’s super easy and tightens just like a speed lace thanks to this lace harness similar to what is on the outside. We found this to lace up just a little bit slower than a speed lace or BOA boot. This boot is excellent for anyone who likes to really dial out their upper and lower adjustability. Ankle Articulation: Rather poor when it comes to ankle articulation when compared to the Kaiju, Vapen or DK Zoom but it’s got a little notch there and the boot will last for a while before it breaks down. You can always add the boomerang ankle stiffeners to and then you will have a stiff flex for a good amount of time. Response: Very very responsive. It’s not s smooth ultra turny response but instead very quick edge to edge. To us we were most comfortable on stiffer more aggressive boards. It felt ideal to go out on something like the Jones Carbon Flagship, Capita BSOD or Arbor A Frame and just lay into turns. Traction: Just about as good as a boot can get for any situation from ice in the parking lot to hiking in soft snow. Sole Cushioning: Felt soft and forgiving just like the Kaiju’s do. Their are a series of individual squares that almost act independently like the Nike running shoes that make for a very shock absorbent and damp ride. It’s easy on your body with out being to pillowy and sluggish. We try to get as many images of the Nike Zoom Ites , but forgive us if they're not all there.